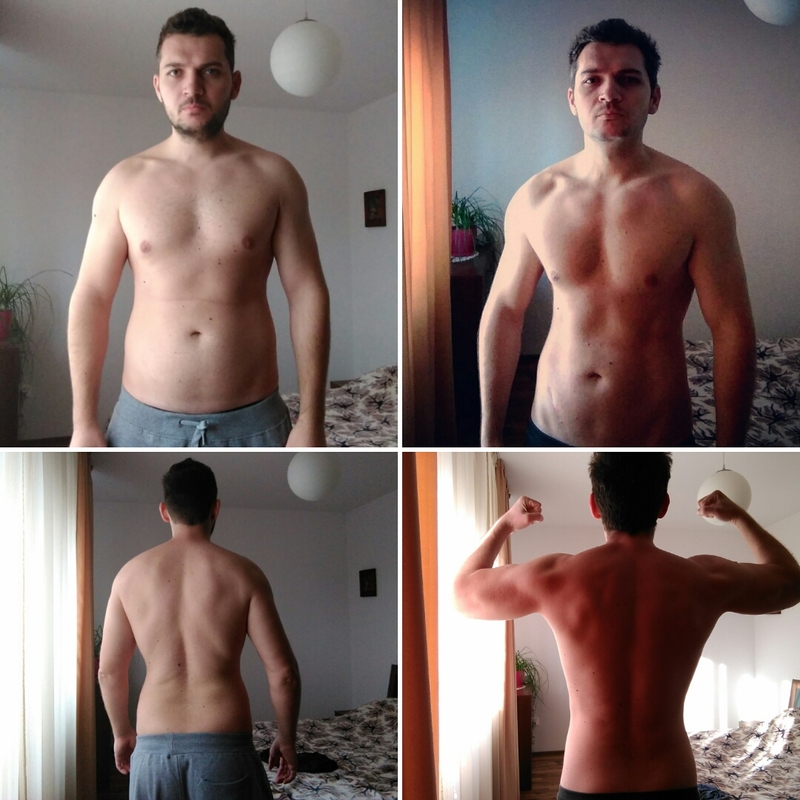 A couple of days ago I updated my last post of my cutting series, saying that I had enough of the caloric deficit stuff and my body is shouting out for more food (even though I am nowhere near lean – I finished my cut at 12% body fat, down from 18%). You can check out the cutting series. Anyways back to the topic, as I was saying I started eating more and thought it would be a good idea to write down a handful of bulking tips and advice for those of you which are wondering when to start bulking, how to do it and when to stop doing it. It’s not rocket science but if you mess it up you can get all fat and flabby, which I am sure it’s not the goal, especially if you put a lot of time and effort in getting lean before. Unlike what many people think, bulking is not a non-stop eating challenge, nor an all you can eat buffet. That’s a bunch of really bad information that floats around about bulking, but more about that later on. But first, here’s a photo with the results of this 14-week cutting phase. First and foremost, let’s set things straight. Bulking = caloric surplus. That’s all it is. If you are not familiar with calories, metabolism, deficit, and surplus it’s all in cutting series. Just like weight loss, gaining weight or bulking is all down to calories in versus calories out. It’s not about the foods you eat or when you eat is simply about eating more calories than your body burns. Those extra calories will be transformed into body weight (both muscle and fat). Of course, proper training is also needed in order to build muscle mass during a bulk phase. You won’t build muscle just be eating more. This is a matter of personal preference. There is no right answer, no a right cut-off body fat percentage or something like that, but there are certain guidelines if you will, that will help you have a better idea of what would be a good approach and what would be a not so good approach. Generally speaking for the average male, a body fat of 10% could be considered as an indicative cut off value. Unless you are preparing to go on stage and compete, once you get down to 10% body fat you are definitely ready to start bulking. At this body fat percentage you are already lean enough, have a six-pack, there’s separation between each muscle groups, you can see striations in the muscles and pretty much there is no point in getting leaner if you are not competing. Again, the 10% body fat level is very subjective; some people may prefer to start bulking at lower fat levels or even at 12%. For females, the cut-off body fat would be around 13-15%. In my opinion, there is no reason to get leaner than that if you are not stepping on stage. As for the upper cut-off point – the body fat percentage at which you should consider stop bulking and start cutting – for the males this is about 15-16% and for the females 22-23%. Or at least this is what I find to be the sweet spot that the majority of people like the way their body looks. Bottom line, the decision to cut or bulk should be made based on your goals and based on how you would like your body to look – some like being shredded, some like to beach type of body and some may like the strong men/powerlifter type of physique. It’s up to you. One special category, as always when it comes to fitness, is the beginners. They can build muscle and lose fat at the same time – this is a very important advantage that advanced lifters don’t have. On top of that, as you may know, beginners are able to build muscles at a very fast rate. This is another advantage you don’t want to waste. For this reason, most beginners should not cut in the first year or so of lifting weights. Unless you are obese or severely overweight you should not cut. Stay at least at maintenance level or in a mild caloric surplus if you are a beginner and you are under 25% body fat. Let’s try to summarize the above text. These are the general guidelines that I recommend. Now let’s see how to bulk. One of the biggest mistakes is eating too damn much. That’s also why some people are afraid to bulk – because they will get fat. So, it looks like we are spinning around in circles – bulk to grow muscles, but don’t bulk to because you will get fat. Let clear the waters a bit. Your body is can build new muscle at a specific maximum rate, regardless of how much you eat. In fact, you only need to be in a quite small caloric surplus in order to make gains at the fastest possible rate (considering your training is spot on). The ‘eat big in order to get big’ theory is true only to some extent. Eating too much damn food will get you fat in no time. Yet, some people prefer this way of doing it just because they like food too much and it’s easy to eat whatever you want all day or because they want to make sure they are not leaving any gains on the table. But this comes at a cost – the amount of fat gain to muscle gain ratio will be bad. According to what the fitness professionals I look up to are saying and based on scientific research, you only need to eat about 10% more calories over your maintenance level in order to make the most out of muscle growth rate. That’s it. Do you realize how little that is? An extra tall glass of milk or protein bar is sufficient to cover that 10% for the vast majority of people. If you maintain your weight at 2,500 kcal you only need 250 extra calories. Ideally, you want to get them from carbs mostly, but feel free to enjoy you bulking phase and through some fats in there if you like that. For those of you who really need to get it more calories in order to gain weight (this will be the case for people with fast metabolic rates, hard gainers), adding a weight gainer supplement to your diet might be a good idea. Here’s a pretty comprehensive list of products. I’d recommend looking at the lean mass gainers. This paragraph is very important. The best way to make sure you’re bulking the right way (lean bulking) is by making sure you are gaining anywhere from 0.5 to 1 pound each week. Ideally, half of that will be fat and half will be muscle – there is no way of bulking without putting on some fat. What you want to do though is to make sure you are minimizing the fat gain. A 50-50 ratio is considered to be good. Basically, for each pound of muscle, you build you will put on a pound of fat as well. But, how can you tell how much fat and how much muscle you put on? A good and cheap way of doing it is by measuring your body fat levels using a fat caliper. Another easy method is to measure your waist as you progress through the bulk. If your waist size is going up too fast it means you are putting on too much fat. If that’s the case decrease the calories. Now, since I mentioned calories earlier, let me briefly touch the topic of caloric maintenance real quick. Most of the guys and gals that start bulking are coming from a cutting phase. That means your BMR (Basal Metabolic Rate) is slowed down a bit from the weeks you’ve been eating less and your workouts might not be as intense as you want them to be because of the caloric deficit. Once you start bulking the metabolism starts to recover and increases a bit, your workouts become more intense because you have more energy. Thus, the caloric maintenance level in bulking mode will definitely be higher than the caloric maintenance level in cutting mode. For example, your maintenance level could be 2,200 kcal at the end of a cut while during a bulk it could be as high as 2,300-2,400 kcal. Add to it the fact that your TDEE (total daily energy expenditure) will be higher when you bulk because the workouts will be more intense, so you can have a couple of hundreds calories difference. You want to take this difference into consideration when setting the surplus. Macros are not that important when bulking, as opposed to cutting. Protein intake doesn’t need to be as high as in a caloric deficit – you are good if you are getting 0.5 – 1 grams of protein per pound of body weight. Split the rest of the calories between carbs and fats as you like and enjoy the food. If you are super serious about your gains though, I would keep the fats under 30% and get the rest from carbs alone. This should give you an extra boost of energy and glycogen to burn in the gym. But why go through all the trouble and count calories even when you’re bulking, measure your waist and body fat percentage? Why can’t you just eat all you want and enjoy yourself since you will build the same amount of muscle? Because dirty bulking (aka eating whatever the fu#k you want to eat) is not the optimal way of doing it. Not to mention that you will not look very aesthetic during and after the bulk. Don’t forget that after bulking you will need to cut again. The cutting phases should be as short as possible; therefore you want to minimize the amount of fat you gain when bulking and need to strip off afterward. That’s why lean bulking is optimal for bodybuilding – it allows you to spend more time in a mild surplus (an anabolic state) and a shorter time in a caloric deficit (catabolic state). Thus, the overall result will be superior to a dirty bulk approach. What’s your take on this? How do you plan and implement your bulking? For how long are you bulking and how much weight you gain when you bulk. I’m looking forward to your comments and questions.